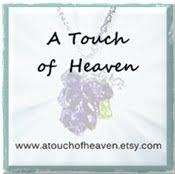 Here's the Etsy treasury I made. 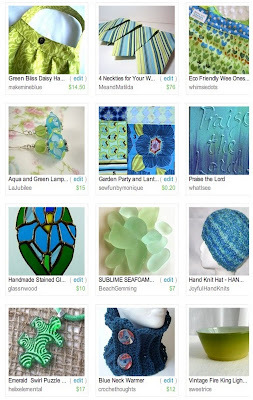 Made searching Etsy for castteam, green, aqua, lime, blue, teal, ocean and sea. The colors of the sea and based on Genesis" ...God gathered the waters..."
I've been featured in a couple of treasuries and one made the front page! Dear friends, I love to hear from you! Please leave me a comment. But remember, keep it clean and if you could post in English so I can read it, I'd appreciate it! Christian,wife, mother, daughter, sister, grandmother. I never know what I'm going to post so you may find information about new products, news about my family, book reviews or sometimes just my humble opinions. I might even share a pattern I've designed. I'm an Amazon affiliate ! Get my new posts in your email - sign up! Click HERE to reccommend ! My Affiliates - I get paid when you shop ! Disclosure of Material Connection: I receive books free from the publisher's book review bloggers program. I am not required to write a positive review. The opinions I have expressed are my own. I am disclosing this in accordance with the Federal Trade Commission’s 16 CFR, Part 255 : “Guides Concerning the Use of Endorsements and Testimonials in Advertising.” Some posts may include links to products or pages at companies for which I am an affiliate. If you choose to purchase an item after clicking one of these links, I will receive a small commission. Thanks for supporting me and my blog in this way. This blog may accept forms of cash advertising, sponsorship, paid insertions or other forms of compensation. The compensation received will never influence the content, topics or posts made in this blog. All advertising is in the form of advertisements generated by a third party ad network.